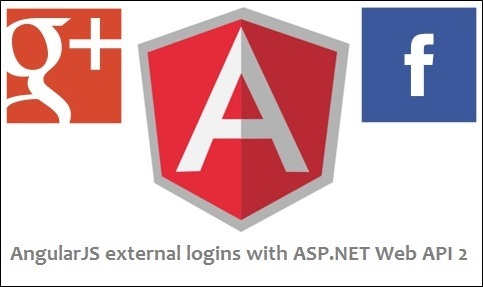 Ok so it is time to enable ASP.NET Web API 2 external logins such as Facebook & Google then consume this in our AngularJS application. In this post we’ll add support to login using Facebook and Google+ external providers, then we’ll associate those authenticated social accounts with local accounts. Decouple OWIN Authorization Server from Resource Server – Part 5. You can check the demo application, play with the back-end API for learning purposes (http://ngauthenticationapi.azurewebsites.net), and check the source code on Github. There is a great walkthrough by Rick Anderson which shows how you can enable end users to login using social providers, the walkthrough uses VS 2013 MVC 5 template with individual accounts, to be honest it is quite easy and straight forward to implement this if you want to use this template, but in my case and if you’r following along with previous parts, you will notice that I’ve built the Web API from scratch and I added the needed middle-wares manually. The MVC 5 template with individual accounts is quite complex, there are middle-wares for cookies, external cookies, bearer tokens… so it needs time to digest how this template work and maybe you do not need all this features in your API. There are two good posts about describing how external logins implemented in this template by Brock Allen and Dominick Baier. So what I tried to do at the beginning is to add the features and middle-wares needed to support external logins to my back-end API (I need to use the minimal possible code to implement this), everything went good but the final step where I should receive something called external bearer token is not happening, I ended up with the same scenario in this SO question. It will be great if someone will be able to fork my repo and try to find a solution for this issue without adding Nuget packages for ASP.NET MVC and end up with all the binaries used in VS 2013 MVC 5 template. I didn’t want to stop there, so I decided to do custom implementation for external providers with little help from the MVC 5 template, this implementation follows different flow other than the one in MVC 5 template; so I’m open for suggestions, enhancements, best practices on what we can add to the implementation I’ll describe below. Once the end point receives the GET request, it will check if the user is authenticated, and let we assume he is not authenticated, so it will notify the middleware responsible for the requested external provider to take the responsibility for this call, in our case it is Google. The consent screen for Google will be shown, and the user will provide his Google credentials to authenticate. Google will callback our back-end API and Google will set an external cookie containing the outcome of the authentication from Google (contains all the claims from the external provider for the user). Google middleware will be listing for an event named “Authenticated” where we’ll have the chance to read all external claims set by Google. In our case we’ll be interested in reading the claim named “AccessToken” which represents a Google Access Token, where the issuer for this claim is not LOCAL AUTHORITY, so we can’t use this access token directly to authorize calls to our secure back-end API endpoints. Then we’ll set the external provider external access token as custom claim named “ExternalAccessToken” and Google middleware will redirect back the end point (/ExternalLogin). Now the user is authenticated using the external cookie so we need to check that the client_id and redirect_uri set in the initial request are valid and this client is configured to redirect for the specified URI (more on this later). Now the code checks if the external user_id along with the provider is already registered as local database account (with no password), in both cases the code will issue 302 redirect to the specified URI in the redirect_uri parameter, this URI will contain the following (“External Access Token”, “Has Local Account”, “Provider”, “External User Name”) as URL hash fragment not a query string. Once the AngularJS application receives the response, it will decide based on it if the user has local database account or not, based on this it will issue a request to one of the end points (/RegisterExternal or /ObtainLocalAccessToken). Both end points accept the external access token which will be used for verification and then using it to obtain local access token issued by LOCAL AUTHORITY. This local access token could be used to access our back-end API secured end points (more on external token verification and the two end points later in post). The code we’ve just implemented above will responsible to call the Challenge passing the name of the external provider we’re using (Google, Facebook, etc..), this challenge won’t fire unless our API sets the HTTP status code to 401 (Unauthorized), once it is done the external provider middleware will communicate with the external provider system and the external provider system will display an authentication page for the end user (UI page by Facebook or Google where you’ll enter username/password for authentication). Now we want to add two new authentication providers classes where we’ll be overriding the “Authenticated” method so we’ve the chance to read the external claims set by the external provider, those set of external claims will contain information about the authenticated user and we’re interested in the claim named “AccessToken”. As I’mentioned earlier this token is for the external provider and issued by Google or Facebook, after we’ve received it we need to assign it to custom claim named “ExternalAccessToken” so it will be available in the request context for later use. a) By looking at this method attributes you will notice that its configured to ignore bearer tokens, and it can be accessed if there is external cookie set by external authority (Facebook or Google) or can be accessed anonymously. it worth mentioning here that this end point will be called twice during the authentication, first call will be anonymously and the second time will be once the external cookie is set by the external provider. b) Now the code flow will check if the user has been authenticated (External cookie has been set), if it is not the case then Challenge Result defined in step 4 will be called again. e) Then we need to check if this social login (external user id with external provider) is already linked to local database account or this is first time to authenticate, based on this we are setting flag “hasRegistered” which will be returned to the AngularJS application. f) Lastly we need to issue a 302 redirect to the “redirect_uri” set by the client application along with 4 values (“external_access_token”, “provider”, “hasLocalAccount”, “external_user_name”), those values will be added as URL hash fragment not as query string so they can be accessed by JS code only running on the return_uri page. Now the AngularJS application has those values including external access token which can’t be used to access our secured back-end endpoints, to solve this issue we need to issue local access token with the help of this external access token. To do this we need to add two new end points where they will accept this external access token, validate it then generate local access token. Why did we add two end points? Because if the external user is not linked to local database account; we need to issue HTTP POST request to the new endpoint “/RegisterExternal”, and if the external user already linked to local database account then we just need to obtain a local access token by issuing HTTP GET to endpoint “/ObtainLocalAccessToken”. Before adding the two end points we need to add two helpers methods which they are used on these two endpoints. We’ve received the external access token from the external provider, and we returned it to the front-end AngularJS application, now we need to validate and make sure that this external access token which will be sent back from the front-end app to our back-end API is valid, and valid means (Correct access token, not expired, issued for the same client id configured in our back-end API). It is very important to check that external access token is issued to the same client id because you do not want our back-end API to end accepting valid external access tokens generated from different apps (client ids). You can read more about this here. The code above is not the prettiest code I’ve written, it could be written in better way, but the essence of this helper method is to validate the external access token so for example if we take a look on Google case you will notice that we are issuing HTTP GET request to a defined endpoint by Google which is responsible to validate this access token, so if the token is valid we’ll read the app_id (client_id) and the user_id from the response, then we need to make sure that app_id returned as result from this request is exactly the same app_id used to configure Google app in our back-end API. If there is any differences then we’ll consider this external access token as invalid. Note about Facebook: To validate Facebook external access token you need to obtain another single token for your application named appToken, you can get it from here. By looking at the code above you will notice that we need to issue HTTP POST request to the end point http://ngauthenticationapi.azurewebsites.net/api/account/RegisterExternal where the request body will contain JSON object of “userName”, “provider”, and “externalAccessToken” properties. once we receive the request we’ll call the helper method “VerifyExternalAccessToken” described earlier to ensure that this external access token is valid, and generated using our Facebook or Google application defined in our back-end API. Lastly we’ll call the helper method named “GenerateLocalAccessTokenResponse” described earlier which is responsible to generate the local access token and return this in the response body, so front-end application can use this access token to access our secured back-end API endpoints. Now this endpoint will be used to generate local access tokens for external users who already registered with local account and linked their external identities to a local account, this method is accessed anonymously and will accept 2 query strings (Provider, ExternalAccessToken). The end point can be accessed by issuing HTTP GET request to URI: http://ngauthenticationapi.azurewebsites.net/api/account/ObtainLocalAccessToken?provider=Facebook&externalaccesstoken=CAAKEF………. Make sure that Provider and ExternalAccessToken query strings are sent with the HTTP GET request. Verifying the external access token as we did in the previous step. Check if the user_id and provider combination is already linked in our system. Generate a local access token and return this in the response body so front-end application can use this access token to access our secured back-end API endpoints. 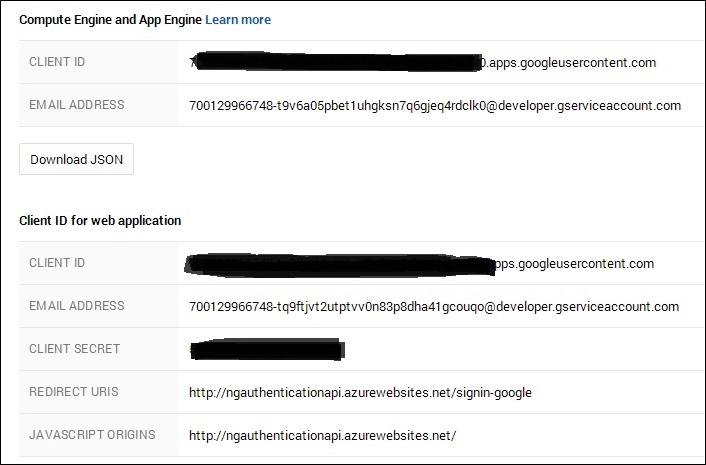 Now once the user clicks on one of the social login buttons, a popup window will open targeting the URI: http://ngauthenticationapi.azurewebsites.net/api/Account/ExternalLogin?provider=Google&response_type=token&client_id=ngAuthApp &redirect_uri=http://ngauthenticationweb.azurewebsites.net/authcomplete.html and the steps described earlier in this post will take place. What worth mentioning here that the “authcomplete.html” page is an empty page which has JS function responsible to read the URL hash fragments and pass them to AngularJS controller in callback function, based on the value of the fragment (hasLocalAccount) the AngularJS controller will decide to call end point “/ObtainLocalAccessToken” or display a view named “associate” where it will give the end user the chance to set preferred username only and then call the endpoint “/RegisterExternal”. That is it for now folks! 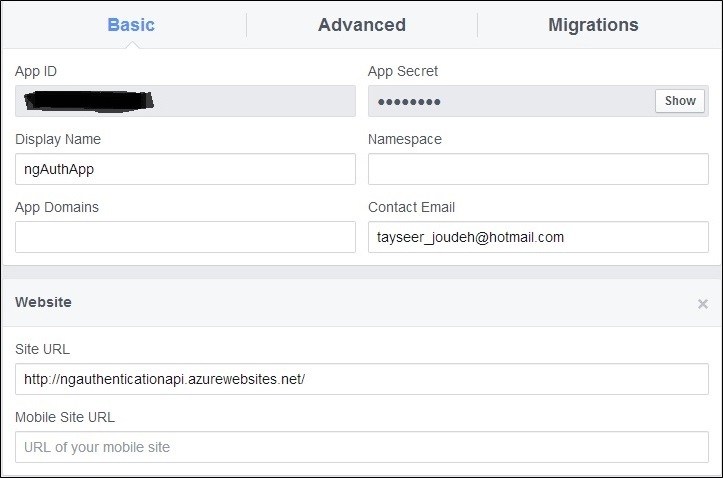 Hopefully this implementation will be useful to integrate social logins with your ASP.NET Web API and keep the API isolated from any front end application, I believe by using this way we can integrate native iOS or Android Apps that using Facebook SDKs easily with our back-end API, usually the Facebook SDK will return Facebook access token and we can then obtain local access token as we described earlier. If you have any feedback, comment, or better way to implement this; then please drop me comment, thanks for reading! Informative post by Brock Allen about External logins with OWIN middleware. Solid post by Dominick Baier on Web API Individual Accounts. Great post by Rick Anderson on VS 2013 MVC 5 template with individual accounts. Helpful post by Valerio Gheri on How to login with Facebook access token. From where I can get the Email address of the user using oAuth following your approach? You can read it from the claim, and it depends on the external identity you are using, you need to ask for the email by using the external identity scope. Not all external identities expose the email claim. Can you please, Help me out. Thank you so much, Antonio, for your feedback, I will check your concerns as this has been written for a while, I will update the code is there is an issue based on your comment. Hello, In register page, How can we use facebook and google+ for register. Can you show an example ? Or update your codes. When redirecting to https://accounts.google.com/o/oauth2/auth ?, the request header Origin is ‘null’ and I get a CORS policy error. I have just finished implementing external logins into an API following your posts. I have actually used a mix of both of your blog series to implement my login flow (JWT Tokens + External providers). These posts have been very useful and informative for working through the OAuth process flow. I was able to successfully get the Facebook external login working, but am getting an error on the Google login. I am successfully getting the Google prompts and authenticating, however, once I click the Allow button in the Google prompt, I always get back an “access_denied” error response. Have you seen this before? Any thoughts as to what might be causing the middleware failure? Once again, great articles :). Hello Aaron, I’m happy that posts were useful and still relevant after all this year. Well I’m not sure why it is not working but double check your return URL and make sure it is the same registered URL in your Google Client Apps. Fantastic tutorial and it REALLY helped me out. Quick question: I am now having users input Username / Password on a front-end form, and these users have the option of logging in with Google. I have client applications on Android which are creating accounts without passwords or emails at the endpoint /api/Account/RegisterExternal. How can I associate or link these 2 accounts since they actually represent one user instead of creating 2 accounts? Well this an implementation detail that should be handled by custom code, but I would check the email used in the external service and see if it was used in the local DB accounts, and create a mapping table between those 2 records to indicate that this 2 accounts belong to the same identity. Hi, and thank you for your amazing work! I have implemented a small variation, I would like to submit and get your feedback on the security perspective. In your solution, when the user goes through the external login challenge, you read the external_token, send it back to the client (as querystring param), then the client submit it to obtain a local_token. In my variation, when the user goes through the external login challenge, I generate a local_token and send it back to the client (as querystring param), so the client can use it without a second rountrip. Of course I run all the validation steps (that you placed in the second round) before I generate the local token. What do you think about it? Does this strategy add any security leaks? Well somehow you are building something close to the “Authroization code” flow, it is hard to confirm or deny if there are security flaws with this approach, but as long you are doing the validation steps and generating a random token each time then this looks acceptable. is refresh token supported in external providers ? Based on the tutorial I built I didn’t use refresh tokens with external identities, it doesn’t make sense to do this when you are logged in to your FB account. Assume that you have changed your FB credentials, then if you are using refresh tokens you will remain logged in while your FB account is not valid. That was my concern when writing this tutorial and thinking of refresh tokens with external accounts. yes , i understand . But i need refresh token cause i need to expire token after 30 minutes for example if user dose not obtain new access token (this for more security). Awesome and very helpful tutorial. I have everything setup and working like it should, but have ran into another use case. When the user logs in or registers via an External Provider, I am not setting the refresh_token property. Therefore, when the access token expires, the ‘token’ (grant_type = refresh_token) endpoint is not able to create a new refresh token. Do you have any suggestions on how we could do this? Great point. Providing users who login externally with a refresh token would allow them to be perpetually logged in to our site, even if they become unauthenticated with the external provider. So I guess from a usability standpoint, it is acceptable to require the user to periodically re-authenticate with the external provider. Thanks again for this post. I have referred several colleagues to it when setting up security for their websites. Thanks for the Tutorial. Have one Question, After the Local Access token expiry, how the client get new local access token? How can I make this work in Safari or in the browser used by facebook? When I am using Safari this is not working. Also, when I am in Facebook mobile app and I click a link to my app the facebook browser cannot handle this login. I am when i configured first time, it works fine. After few days Facebook oauth returns an error , access_denied. i have changed url setting, still not working. Thanks for the perfect step-by-step tutorial. It really is a good summary of several other complicated ones. I applied them to this step but encountered with an error at the end. When I try sending an external login request, on first pass of step 7 it goes into unauthenticated and redirects to Facebook. But after Facebook login, it does not go back to GetExternalLogin action of Accounts controller. Instead, it returns an access_denied message. Do you have any suggestions for where to look at? I’m not sure why is this happening but can you make sure using the same NuGet package I used so you can trace the issue, with the code in Github it should working perfectly. Thanks mate, I update my nugget package and it becomes to work. I am working on a similar implementation, but having client side mobile app (developed in AngularJS Cordova) and also webapp using AngularJS. My concern is, if I call GetExternalLogin from my mobile app, it respond as a redirection to the external login provider’s login screen. Will it be a response to my mobile app and I have to handle that redirection? I will try that out in next few days but wanted to know if you tried this. If GetExternalLogin redirects to my mobile’s browser, I will have no way to let my mobile app know that the external login is done. I was thinking to let my mobile app call the external login provider’s login screen and receive the token back (using in-app browser) and then calling my API to validate that token, register user and obtain local token. Hi Hitesh, your assumption is correct, you need to use in-app browser for this to get the token back to the app and sent it for validation. I was following this tutorial to integrate with linkedin. My observation is that once I get authentication code for my user from linkedin I will link him with my local Data base, Now what if the authenticated user changes his password in linked in ?The access token is granted every time with has local account =true when I call GetExternalLogin API. without asking user to login again with changed password. How to tackle such situation? It seems the source code doesn’t have external logins implemented. Would it be possible for you to update it or point out source code that contains this part? Helped me alot. I have implemented it in my work with few twists as per requirements but some how I am claiming for mobile number too but I get a null value. Can you help me out in this. Well, how did you set the claim for the mobile number? You need to inspect this area first. More over I am able to login to the facebook and getting also the username but somehow I need email address from the response but eventually its coming null, so please can you help me out in this. I got stuck with the claims please can you me out. Very nice article. I want to ask one more thing. You have Registered User using only username. How can I register user with additional information. e.g. I am using Google Authentication and want to store user’s image, occupation, skills. I have customized my DB and ApplicationUser class with these additional properties. I am getting these properties in claims. But don’t know which function from your code to use to store these fields. I tried the Demo Application link, both FB and Google login showing error. I think You have hosted the demo without ClientId and ClientSecret. I don’t have time to go through it all at the moment but I have bookmarked it and also added in your RSS feeds, so when I have time I will be back to read a lot more, Please do keep up the superb job. Quick question. What do I need to put on externalAccessToken? I don’t get it. Hi! First of all thank you for your posts, these are very clear and helpful. I just want to ask you, what do you think about which layer should be responsible to GET/POST data from google/facebook APIs? For instance get profile image or post new comment. Should be in the front end side (angularjs) or backend side (API)? Thanks for the perfect tutorial. I have implemented google Auth sucessfully and trying to add Miscrosoft Authentication. I din find the Access Token verification url for Microsoft. I can call the below url with access token which gives me the necessary details, But i dint find anyway to validate the token for the specific client. Please help me if you have any idea.. I really find your tutorials on authentication useful, thank you! I have been struggling to do the same thing – Google login on a Web API for a few days now. This has led me slightly I think in the right direction, the problem is I am using Core! Any plans for an updated post? Could you maybe clarify this for me? When you reload the angular app, how can you check if the user is still logged in into facebook in the browser? Taiseer, thank you! This article helped me a lot. Hey. Thanks to the useful and practical article. It helped me a lot to understand token-based auth mechanism. I had implemented the solution exactly step by step based on article (with getting help of git source). But in GetExternalLogin I’m getting a 401 error page without any redirect information. It seems to me the line `Request.GetOwinContext().Authentication.Challenge(LoginProvider);` doesn’t do anything. Have you any idea please? Thanks in advance. I loved this article, i was searching a article like this from last three days, i have change my code some place after understanding your approach, I have done the same in Angular 5 with WEB API 2(Facebook and Google social login from Angular 5 App with WEB API). Its was a great integrated article. Its helped me aloooooot. I loved this article, i was searching a article like this from last three days, i have change my code some place after understanding your approach, I have done the same in Angular 5 with WEB API 2(Facebook and Google social login from Angular 5 App with WEB API). Its was a great integrated article. Its helped me a lot.